The best-selling author of Overthrow and The Brothers brings to life the forgotten political debate that set America's interventionist course in the world for the 20th century and beyond. How should the United States act in the world? Americans cannot decide. Sometimes we burn with righteous anger, launching foreign wars and deposing governments. Then we retreat - until the cycle begins again. 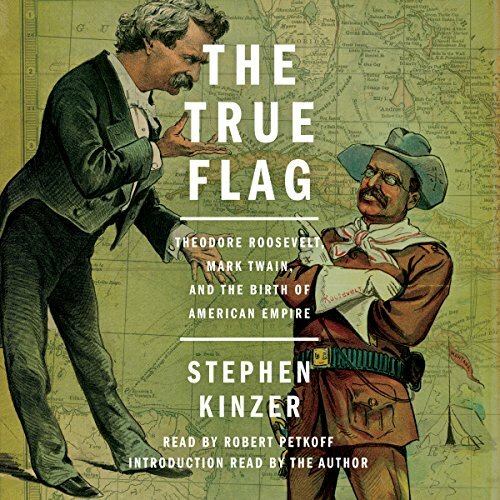 Revealing a piece of forgotten history in The True Flag, Stephen Kinzer transports us to the dawn of the 20th century, when the United States first found itself with the chance to dominate faraway lands. That prospect thrilled some Americans. It horrified others. Their debate gripped the nation. The country's best-known political and intellectual leaders took sides. Theodore Roosevelt, Henry Cabot Lodge, and William Randolph Hearst pushed for imperial expansion; Mark Twain, Booker T. Washington, and Andrew Carnegie preached restraint. Only once before - in the period when the United States was founded - have so many brilliant Americans so eloquently debated a question so fraught with meaning for all humanity. All Americans, regardless of political perspective, can take inspiration from the titans who faced off in this epic confrontation. Their words are amazingly current. Every argument over America's role in the world grows from this one. It all starts here. This program includes an introduction read by the author. I'm currently active duty Army with 17 years in service. In my opinion, this book should be read by every soldier and, most importantly, by our politicians who decide whether to send us into harms way. As the author demonstrates so eloquently in this book, intervention abroad (whether by democrats or republicans) rarely leads to the intended goals due to ignorance, hubris, and unintended consequences. The Spanish-American War is a little understood and rarely discussed period of American military history. But that really should change given that the vigorous debate surrounding it are just as relevant today as they were over 100 years ago. Highly Relevant History Lesson Well Told. This well told history of the Spanish American War serves up many insights into the roots, motivations, and perils of American intervetion abroad right up to our present quagmires in Iraq and Afganistan. The heated political debates among giant personalities are as relevant today as they were in the 1890s. These are lessons we have not yet learned as a nation. Our failure heed them will create an increasingly unstable and dangerous world. Excellent and important book. Highly recommended. When one takes a look at the beginnings of the policies that formed today's political climate, a greater understanding of our times can be achieved. Expansionism, Imperialism, or conquest beyond our current borders didn't just start with the latest Presidency. Looking at Teddy Roosevelt , the Spanish American War, the Philippine Insurrection, McKinley's assassination and other events of the period will help us see how America got where we are today. Every American needs to read this book. I implore you to do so. As a bonus, it's also a very engaging story. I thought I was familiar with American history. But the great debate between imperialists and anti-imperialists at the end of the 19th century and beginning of the 20th century, was largely unknown to me. The author provides a detailed and fascinating exploration of that debate. Narrowly lost by the anti-imperialists, the outcome of that debate has shaped our 20th century American experience and is important to understand. I commend the book without reservation. Very well presented, and a good historical read. A must for all history buffs and political minded junkies. A well researched, well written and well narrated history of Spanish American War and beyond. Required to understand today's political world! Kinzer lays out in detail the men and thinking that changed American foreign policy- and the world by consequence. This book is both insightful and depressing in that it showcases how the same false premises are used time and again to justify military action as a means of economic growth. Truly a book I'd want any member of Congress- and the citizens that vote for them- to read! This is an important book for a look at how we got to the military industrial complex that is the current state of US foreign policy. William McKinley's assassination muted his effect on this result along with Teddy Roosevelt's hyper masculine militarism which overshadowed McKinley. Roosevelt ironically became bored with imperialism and moved past it later in his Presidency though his advocacy of it propelled him to the Presidency initially and inspired Mckinley's assassination. This dramatic moment in American history is made so vivid in Mr. Kinzer’s book. So many larger than life characters against the backdrop of the last years of the Nineteenth Century. I thoroughly enjoyed it!